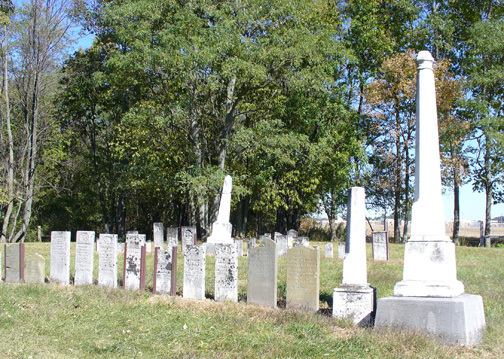 Like lighthouses in a sea of green, the Crosley Cemetery's white stone pillars, above, can be seen from a distance while traveling east on Reformatory Road. Close up, the stones for the Crosley family are along the west side of the cemetery. The tall pillar, right foreground below, is for pioneer patriarch Conrad and his wife Elvira. Conrad's data is on the north face and his wife Elvira's is on the south face. One of the very first settlers to Madison County and another man who was a veteran from the Revolutionary War rest in this picturesque family cemetery. 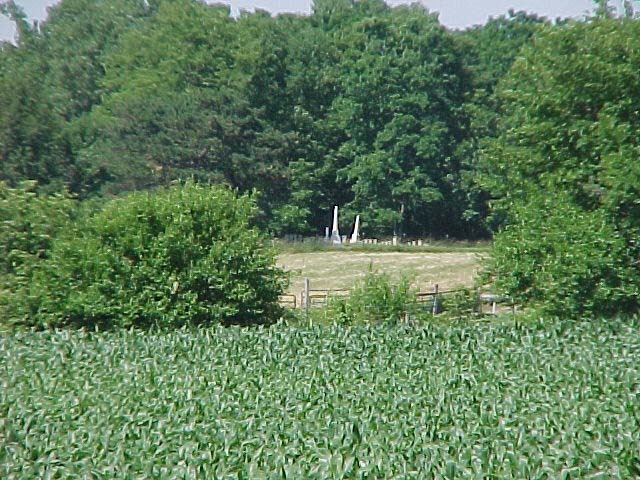 The white gravestones of the Crosley Cemetery can be seen easily from a distance since they are located on a high hill on the north side of Reformatory Road. Reformatory Road was first named the Indiana Highway when it was cut out of the wooded wilderness in early Madison County history. This "highway" was the only overland trail, dirt path, or "trace" between Pendleton and Indianapolis. 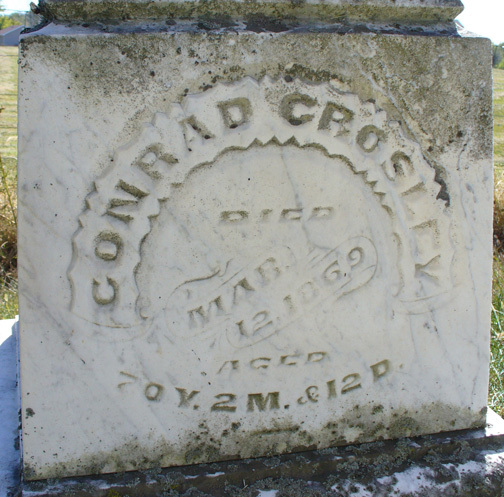 One of the earliest to settle the land along its route was the family of Conrad Crosley. "Mr. C. will be remembered by many as one of the staunchest citizens of the county. An instance of his kindness will be given which actually took place in the year 1823. Mrs. Hollingsworth, after a severe spell of sickness, desired some tea. Mr. C., learning of this, started to New Castle to obtain some. 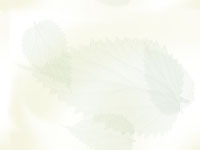 Finding none there, he continued to Richmond, where he met with like success; not easily discouraged, he continued to Eaton, Ohio, where the coveted herb was obtained. Mr. C. returned, and a cup of tea was made to gladden the heart of Mrs. Hollingsworth, who lived to remember the act of humanity, which had few equals at that day." Evidently, one of Conrad's favorite stories involved the lumber for the first Indianapolis court house since a summary is included in the 1880 History of Madison County, Indiana by the Kingman Bros. Publishing Company. According to Conrad, the lumber for the court house was actually cut at the falls on Fall Creek in 1824. Mr. Crosley and his crew had been contracted to raft all the lumber to Indianapolis. After the lumber was cut, it was then hauled in wagons to a spot on White River below Anderson. Part of the lumber was built into a large raft, which floated the rest of the lumber to Perkinsville. At Perkinsville, there was a primitive dam, so the raft had to be taken apart. All of the lumber was hauled around the dam and then reconstructed into the make-shift flotilla. This was the only troublesome section of the journey. Near Noblesville, a large fish floundered onto the raft. Conrad caught the fish and going to a nearby homestead exchanged with the lady of the house "material to replenish their jug." The trip was filled with other incidents and remained a memorable, happy adventure for Conrad the rest of his life. The 1880 history gives the character of Conrad Crosley high praise: "He was of that class of material best adapted to the necessities of a new community--brave, honest, and humane." Conrad Crosley was not just an exemplary pioneer settler but an exemplary man for any time period. The stones for the children that died in Conrad and Elvira's family are reset to the north of the parents' pillar. While three of the stones in the picture above are for children from other families, the eight others presented unique situations for transcribers. The four brown granite stones, to the extreme left and right, were the original grave markers. 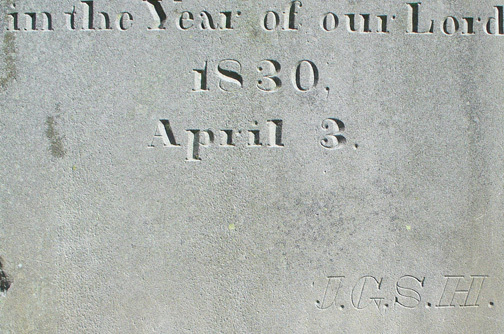 These stones date from the 1830s. Four of the light gray stones, middle, are replacements for the granite stones. The light grays were carved in mid to late 19th century. 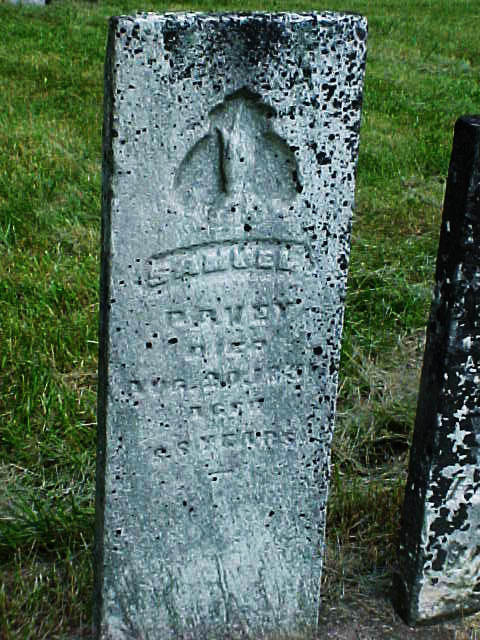 Replacements or duplicates for stones that still exist, representing private citizens, are not found in any other Madison County cemetery. Additionally, in the right corner below, the oldest stone at the Crosley, the granite second from the right above, has beneath the data these capitalized letters: "I. (J.?) G. S. H." Are these the initials of the carver or an abbreviation for a favorite phrase or Bible verse? American Revolutionary War soldier Samuel Pavey, left, was born in Accomack County, Virginia, in 1763. He was a member of the Virginia Militia. Samuel and his wife Hethy, right, were among the early settlers to Fall Creek Township. 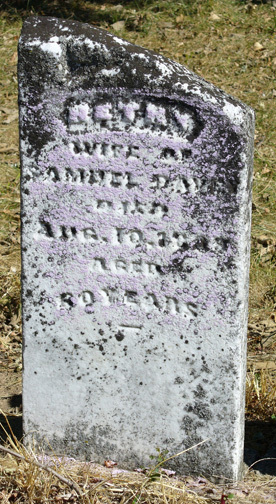 While Hethy died in 1838, Samuel lived to be eighty-eight years old and died in 1851. He applied for his pension in 1835 when he was seventy-two. He is listed in Margaret Water's Supplement to the DAR Index of Patriots, and his stone is still quite legible. His marker is reset with the Kinnaman family's; hers with the Pettigrew's. Other adult family members are represented at the Crosley. 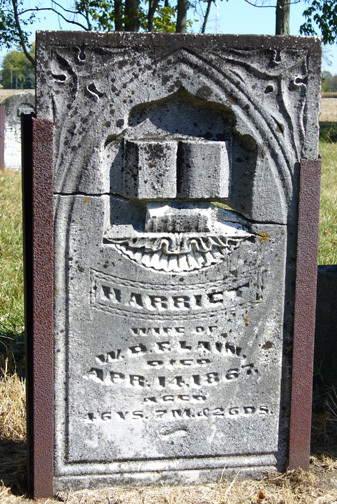 Harriet Lain's very decorated stone, left, states that she was the "wife of W.D.F. Lain died Apr. 14, 1867 aged 46 ys. 7 m. & 26 ds." Carved under the arch and filigreed corners is the Bible which is supported by a table with ruffles. 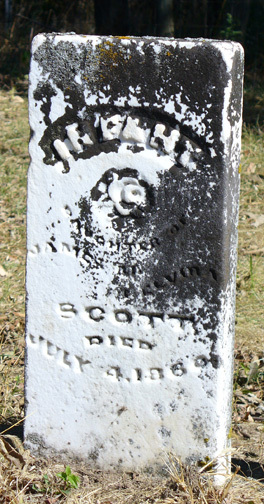 John Marsh's 1862 stone, right, lies in the 3rd row of stones from the west. That is also a Bible at the top. Casandra Kinnaman's pillar, left, is one of those that can be seen from a distance. 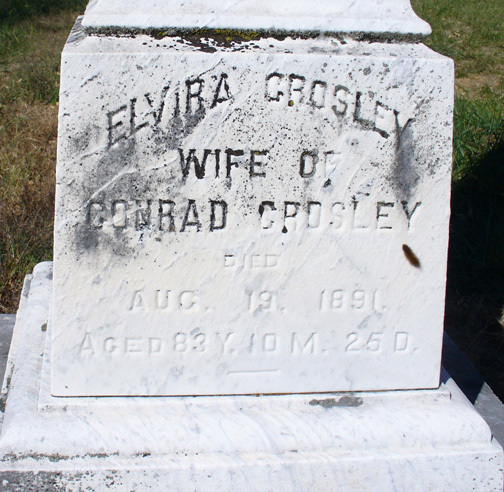 She died May 24, 1870, at fifty-seven years old. Two of her children, an infant son and Margraet Lovina, right, are buried next to her. The Kinnaman family is listed among the early land owners in Fall Creek Township. Their markers sit in the second row. 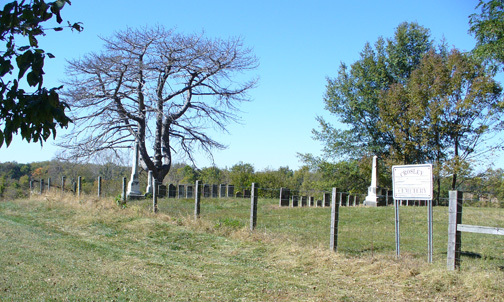 The Crosley Cemetery witnesses a medical fact from the 19th century: the death rate for children was one out of four and often one out of three. 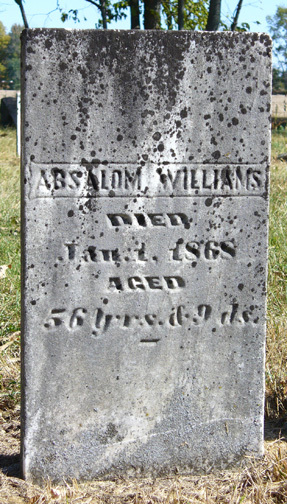 The stones for the Williams family, also set in the second row, give evidence to this. 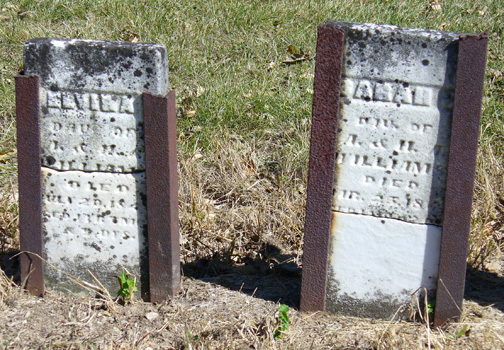 Husband Absalom, left, died in 1868 at fifty-six years; wife Hester, right, died in 1875. 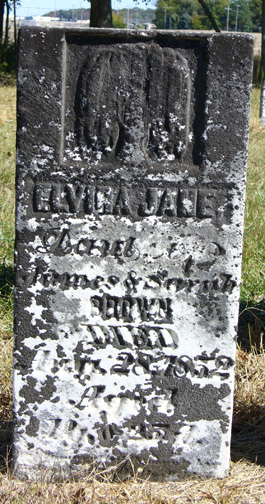 They lost five children, left to right above: Elvira, Sarah, William F., Hester A., and Absalom J. Of the six stones above, only two are for adults. 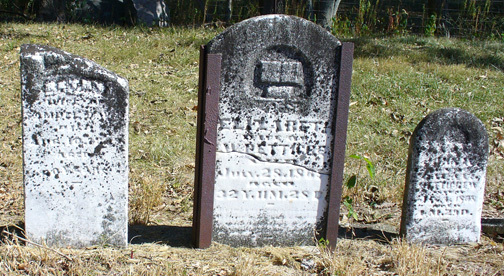 In the picture at right, the center marker is for Elizabeth Pettigrew who "died July 28, 1869 aged 32 y. 11 m. 28 d." To the left is the stone for Hethy Pavey discussed above. To the right is the marker for a Pettigrew child. 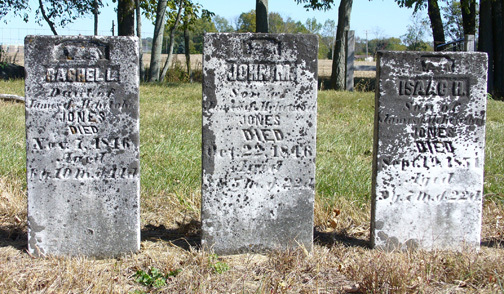 In the picture at left are the three stones for the Jones children: Rachel and John, who died in 1846, and Isaac, who died in 1851. All three of the Jones markers have lambs, a symbol for innocence during this era, carved above their names. The parents are not recorded as buried here; perhaps the couple moved on. 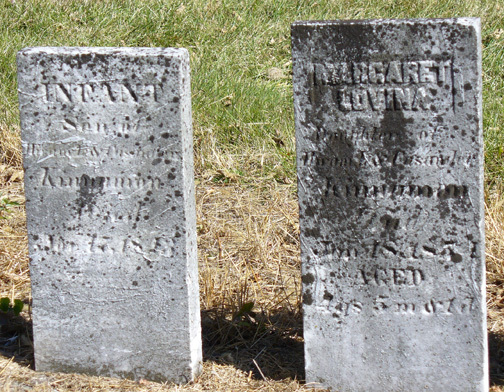 Two other children Elvira Jane, left below, and a Scott infant, right below, are also buried here without parents. In the 1970s, the Crosley Cemetery was part of a cow pasture. At that point many of the stones were broken and resting in piles against the pasture fence. 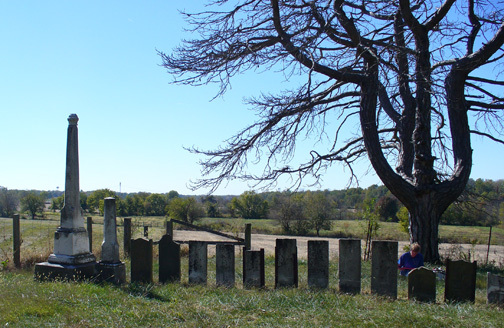 The newly-formed Madison County Cemetery Commission undertook the cemetery's reclamation. The MCCC fenced off the graveyard, cut down vegetation along its borders, re-landscaped the area, provided a gate and an access lane, restored the broken stones, reset them into family groups, and turned the finished graveyard over to the township trustee for maintenance. This beautiful spot along the pioneers' trace was restored, and Samuel and Hethy Pavey's stones, the Crosleys', Kinnamans', and Pettigrews', etc., were preserved. Pictured above are the fence and sign for the Crosley as well as the method of resetting stones in lines denoting family groups. During a 1980s expansion of the nearby Pendleton Reformatory, two human skeletons were uncovered. After scientific analysis, it was determined that the remains were those of a related adult and child from the first quarter of the 19th century. 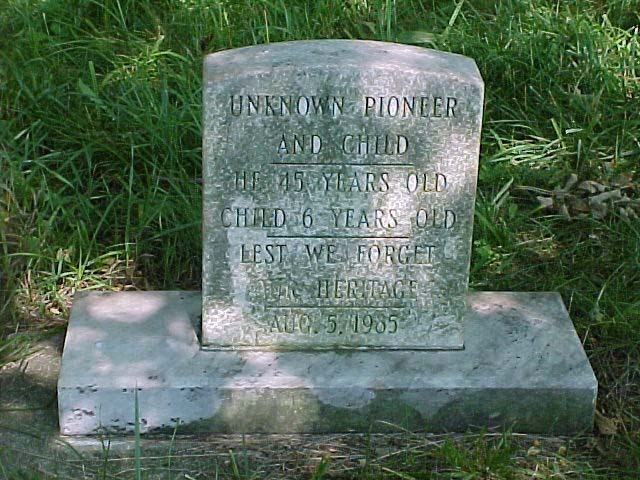 The bones were reburied in the nearest pioneer cemetery--the Crosley. 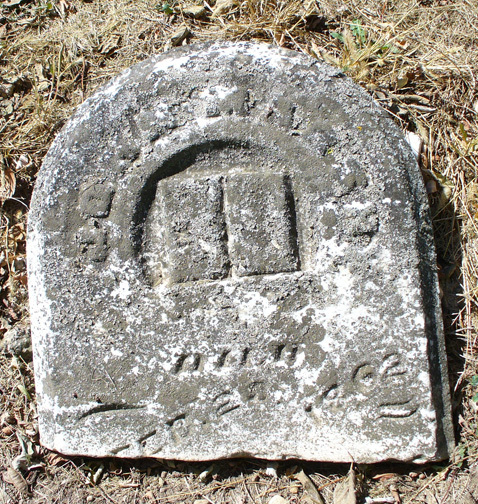 The stone pictured above was placed over their grave by the Madison County Cemetery Commission. The stones of the Crosley family look west over the Indiana landscape the family helped settle. At the base of tree, that is new (2010) MCCC member Sherry Ballinger in blue.